I live in a tropical country where most of the time we celebrate and habituate in heat, humidity, and tropical rains. My country is known for its 7,641 islands. Yes, too many that an average Filipino like myself cannot even finish visiting them within a year! Our tropics are very diverse, but one thing that I can boast about is our rich marine culture and lush, unadulterated greenery. But for a city girl like me, I hardly see sand and sea. The nearest beach to me is a four hour drive away and it takes a lot of effort for me to take some time off during the year. Today, among others..I long for the tropics. Summer went by but I was not able to see the beach! 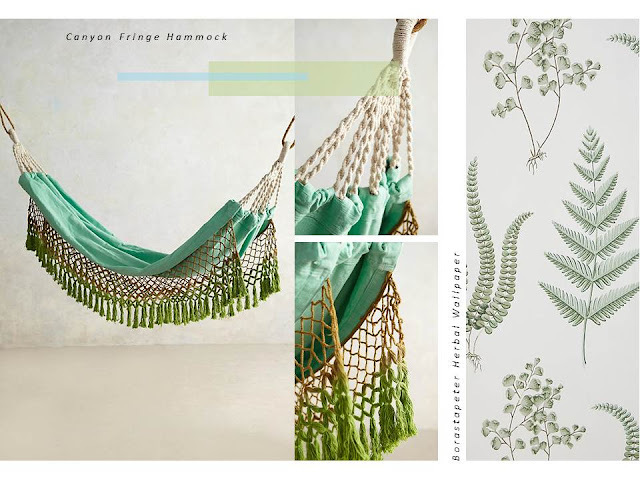 As I was going through the ANTHROPOLOGIE website, I found a few objects that I came to love and made my dire need for the real tropics even stronger. Here are some of my picks! I just love the colors and patterns of these platters. Summer is never over with these beauties! The Terai Chair come in different patterns, but this is my favorite among the rest. It could be my bias for the pink and peach hues and the charming representation of the forest. Who wouldn't want a hammock in their house? I just love the pastel color of this one and its combination with the weaving and tasseled edges. I remember just a few weeks ago, my best friend Cathy and I were talking about tassels and pompoms. This really looks great on a plain wall or with a muted wallpaper like this herbal patterned wallpaper by BORASTAPETER. I'm on a hunt for a pretty hamper and this one is perfect for me! I visit Anthropologie on a weekly basis to find inspirations for Design and Styling. I love how muted and diverse their collections are and I also like how they style their vignettes! Do check their website out for more products and interior inspirations! What are you currently longing to do or visit?